Here's a pleasant surprise: the Wii U looks like it's going to have a proper online community built into the console. In a video shown during a pre-E3 conference, a user on the console jumps onto the controller and consults a GameFAQs-like service, while at the same his friend is monitoring Tweet-like messages on his phone. That latter part is especially nice, given Nintendo's previous reluctance to branching its services out onto other platforms. Also displayed was a video calling service similar to Skype. 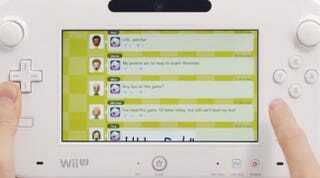 Nintendo also showed off the ability for users to share screenshots, share user-created content and chat as Miis.